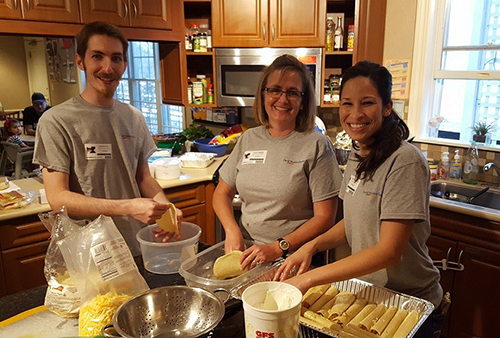 Orlando, FL (April 11, 2017): David Weekley Homes, the nation’s largest privately-held home builder, partnered with Ronald McDonald House Charities® (RMHC) of Central Florida to Share-A-Meal during the builder’s “Rally for RMHC Month.” Throughout March, 40 David Weekley team members volunteered more than 100 hours to cook seven meals for guests staying in Orlando-area Ronald McDonald Houses. The connection with Ronald McDonald House Charities® of Central Florida continues as David Weekley Homes hosts the World’s Largest Showcase of Homes throughout the month of April. For every visitor or real estate agent who registers at a model or showcase home between April 1 and 30, the builder will donate $5 to the local nonprofit. The volunteer effort and donations are initiatives of the company’s CARE program, which is a charitable and volunteer program that joins team members with homeowners, homebuyers, community partners and local nonprofit organizations to live out its purpose, Building Dreams, Enhancing Lives in all the communities in which it builds. This is accomplished by company team members volunteering countless hours to different organizations in their communities and by The David Weekley Family Foundation donating more than $100 million to a variety of organizations throughout the U.S. and abroad over the past 20 years.